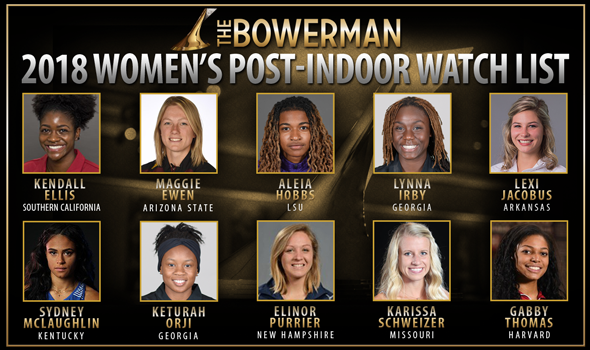 NEW ORLEANS – It seems that the criteria needed to be added to the 2018 Women’s Post-Indoor Watch List for The Bowerman was to simply set or tie a collegiate record. Just ask the three women who found themselves on the newest addition of The Watch List for track & field’s highest honor, announced on Wednesday by the U.S. Track & Field and Cross Country Coaches Association (USTFCCCA). Southern California’s Kendall Ellis, LSU’s Aleia Hobbs and Harvard’s Gabby Thomas all made their season debuts after historic performances in College Station, Texas, this past weekend at the NCAA Division I Indoor Track & Field Championships. Ellis posted a blistering time of 50.34 in the 400 in a loaded field that featured two other women on The Bowerman Watch List, breaking a collegiate record that stood since 2014. Ellis inched out fellow Watch List honorees Sydney McLaughlin of Kentucky and Lynna Irby of Georgia by .02 and .53 seconds, respectively. The senior from Pembroke Pines, Florida, also helped the Women of Troy capture the 4×400 indoor title with a time of 3:27.45 that stands as the fifth-best mark in collegiate history. Hobbs led a quartet of Tigers that competed in the 60, where she notched a collegiate record-tying time of 7.07 for the victory. The product out of New Orleans tied the record set by Oregon’s Hannah Cunliffe on February 11, 2017. Thomas made her debut on the Watch List after setting a record of her own. The junior from Florence, Massachusetts, ran a 22.38 in the 200 to win the Crimson’s first national title since 2001. Her time also set a collegiate record, breaking Texas’ Bianca Knight’s time of 22.40 set during the indoor championship meet back in 2008. Additionally, Thomas’ mark sits fifth on the all-time world record list and second on the American performers list. Thomas also became the first Ivy League woman to be named to the Watch List since Princeton’s Julia Ratcliffe on Jan. 8, 2015. Outside of the three new faces, five women from the Pre-NCAA Watch List returned to the newest iteration and were joined by another familiar name. Arkansas’ Lexi Jacobus found herself back on the Watch List this week alongside Arizona State’s Maggie Ewen, Georgia’s Keturah Orji, New Hampshire’s Elinor Purrier and Missouri’s Karissa Schweizer, McLaughlin and Irby. A total of six NCAA Division I indoor titles were claimed by the group. Schweizer became the first Missouri Tiger to post back-to-back titles in any indoor event after picking up her second-straight 5000 title (15:43.23). More importanly , the product out of Urbandale, Iowa, also won the 3000 with a time of 8:53.36, becoming just the fifth woman in meet history to win both the 3000 and 5000 at the same meet. Orji became just the second woman to win three consecutive indoor triple jump titles, and she did so in grand fashion. The Mount Olive, New Jersey, native set a meet record with a leap of 14.27m (46-10). The senior also posted a runner-up finish in the long jump at 6.52m (21-4¾) to give her team 18 points to its national-championship winning total of 61. Ewen won her first indoor shot put title by recording the sixth-best mark in meet history at 18.49m (60-8). The redshirt-senior from St. Francis, Minnesota, also placed fourth in the weight throw for her second First Team All-America honor of the championships. A runner-up in the mile a year ago, Purrier took home the title this season with a time of 4:31.76. The victory for the product out of Montgomery, Vermont, marked the first national crown in any indoor event for any athlete from New Hampshire. Jacobus returned to the Watch List after falling off after the Preseason Watch List. The junior from Cabot, Arkansas, broke her own meet record in the pole vault on her way to winning her second title in three years in the event with a leap of 4.66m (15-3½). While Irby and McLaughlin didn’t win a national title in their first go around, each made a significant contribution to their programs. Irby scored 12 points for the national champion Bulldogs with third-place finishes in the 200 and 400, while McLaughlin placed second in the 400 and fourth in the 200 in addition to helping the Wildcats’ 4×400 team place fifth. Falling off the Watch List, but receiving votes was LSU’s Mikiah Brisco and Kentucky’s Olivia Gruber. Also receiving votes was San Diego State’s Ashley Henderson. The next Watch List will be announced on April 18.